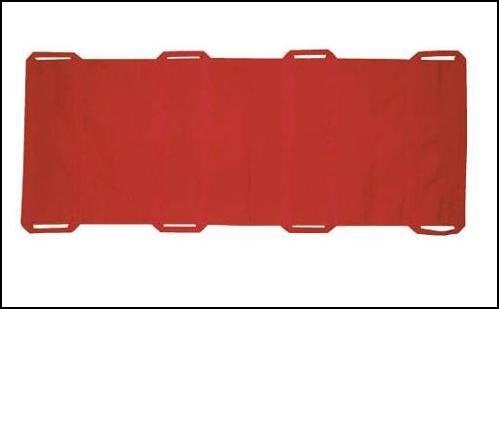 This compact folding soft stretcher is SafetyKitStore's cost effective solution for search and rescue, student, personnel, patient and pet or animal evacuation. The Evacu-Aid Stretcher has eight hand grips to allow fast and safe transport of an immobile person or animal up to 300 lbs by 2, 4 or even 8 people. It's easy-to-use design makes this stretcher an excellent choice to move and evacuate walking impaired people (or animals) from schools, hospitals, nursing homes, care facilities, private homes or offices. full size dimensions: 72" x 28"
Unlike rigid stretchers, the unique design and placement of the carry handles allows this stretcher to be used with the immobile person sitting up with 2 people carrying or the immobile person (or animal) laying flat with 2, 4 or even 8 people safely carrying. While the stretcher can carry 300lbs and was tested with 500lbs peak weight, the carry weight limit should be determined by the physical condition of the people that carry the disabled person or animal. The unique design also allows for this stretcher to be used as a drag-sheet while getting and maintaining a secure grip through the carry handles. Use as a drag-sheet allows one person to evacuate another. Please note that dragging can cause wear on the stretcher, depending on the ground surface condition. This stretcher is a soft type stretcher. A backboard should be used when neck and back injuries are present.